I’ve replied to hundreds of your queries on hallmarks and now its my turn !! HELP !! I wonder if any of you have seen this V/L hallmark before. See the photos for the hallmark and the buckle itself. The buckle is from a collection we purchased from a gentleman who bought buckles over the last 10-40 years and kept them in a display case so they are NOS (New Old Stock). The prong on this buckle was shaky so we had the prong replaced – that is the only new part on it. 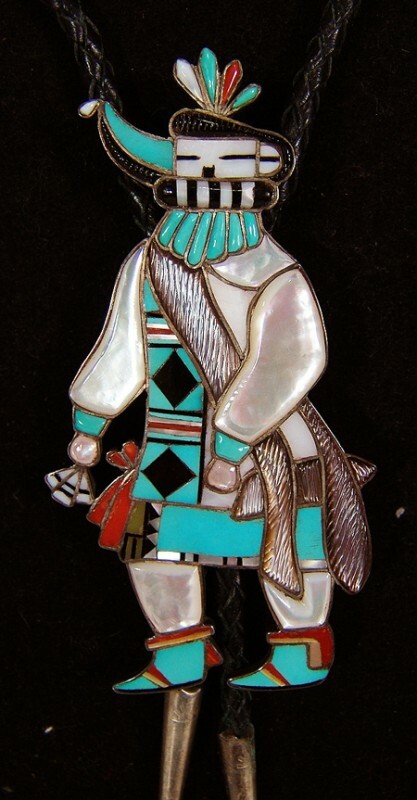 It is a Zuni inlay of Longhorn Kachina also known by and associated with other kachina names including Saiyatash, Sai-astasana, Zuni Rain Priest of the North, and Hututu. Some say that Longhorn Kachina is usually accompanied by his “Deputy” Hututu. They look quite similar. Longhorn Kachina has a single long horn sticking off to the right side of his mask and is always seen with his distinctive black and white (striped or checkered) neck ruff. He has a long left eye which is said to bring a long life to good people. In addition, he is called a hunter/warrior and the Rain Priest of the North who has the ability to control the weather. 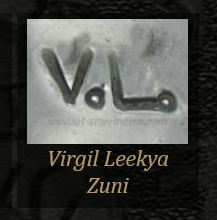 I’ve researched the hallmark in all of my references and online and so far this is what I came up – it is NOT the same as either of these other VL hallmarks. Any ideas? 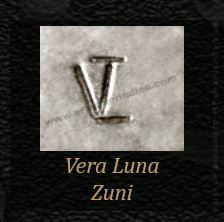 Since artists do change their hallmarks over the years and since one reader showed me a piece by Vera Luna that seems to be a match to this buckle, I will surmise, this buckle was made by Vera Luna. Here is the bolo. 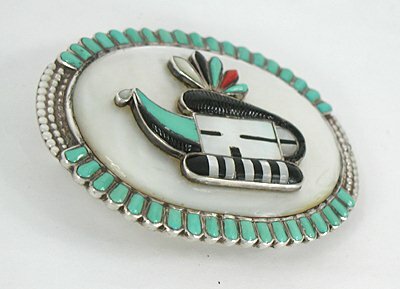 Except for the fact that the kachina on the buckle has one extra black feather, these are twins !